Ø Double clamping mechanism, unilateral opening can be adjusted with the range, do two simultaneous machining workpieces of different sizes. Ø When the case of a larger workpiece, the original opening is no insufficient clamp, you can dismantle the middle of the clamping jaw to increase clamping distance. Ø Vise body material is high ductility of spherical graphite cast iron (FCD600), vise both sides of the slide hardened heat (HRC50°), ensure high precision and high wear resistance, high tensile strength. Ø Angle lock semi-sphere can be generated under the power of the lock, remove workpiece to be lifted. Ø The vise has five clamping ways. 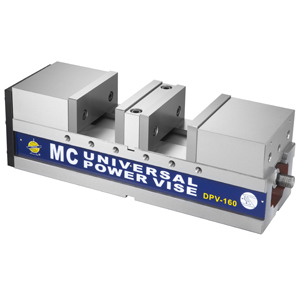 Ø The vise with anti-litter design prevents iron filings into the vise, and iron filings easily discharged inside the interior and extend its lifetime.